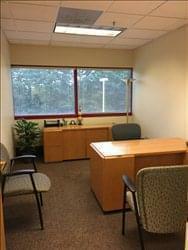 Find My Workspace lists over 95% of the executive office suites market in Eatontown. Simply click Request Quote to check pricing for one office, or Add to Basket for multiple offices. This full service business center designed for small and growing firms that features fully furnished offices, a wide range of technological and secretarial support services with flexible terms. Caters to, executives who no longer want to work from home, startup firms who require space with flexible terms, satellite offices for major corporations, secretarial and support services for “road warriors” who travel frequently and need a home office with voicemail services and secretarial support. The center also offers a gourmet café servicing breakfast and lunch as well as a fitness center in the building for your convenience.